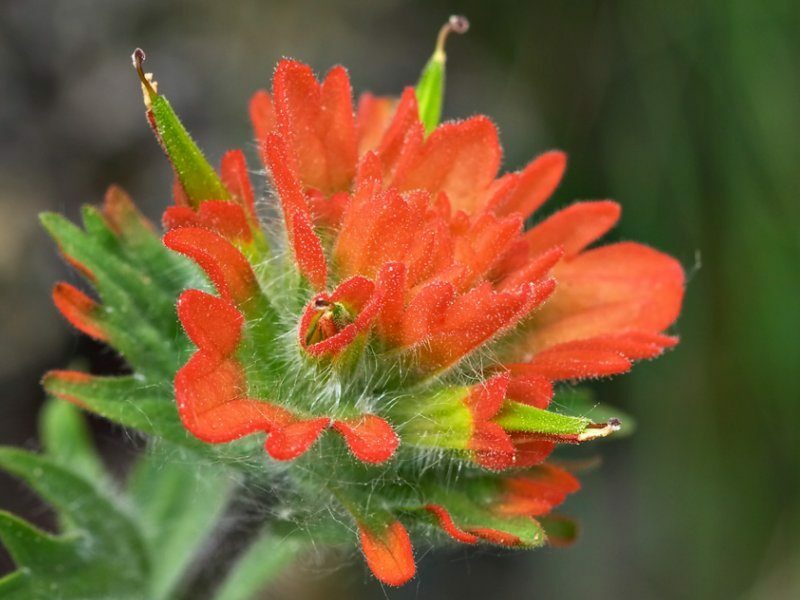 This red paintbrush was photographed near Merritt, BC, last weekend. This photograph was taken at Jervis Inlet, British Columbia, on a very enjoyable Botany graduate field trip with UBC bryologists Shona Ellis and Wilf Schofield (co-author of the Takakiaceae for the Bryophyte Flora of North America project), organized by graduate students Nyssa Temmel and Chris Sears. 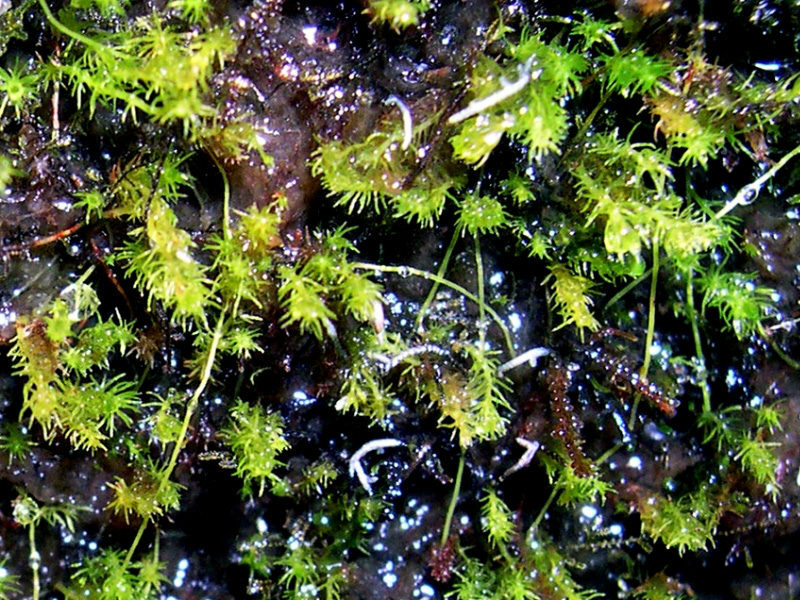 There are two recognized species (as of 2005) in the genus Letharia (the wolf lichens), and both can be found in western North America. 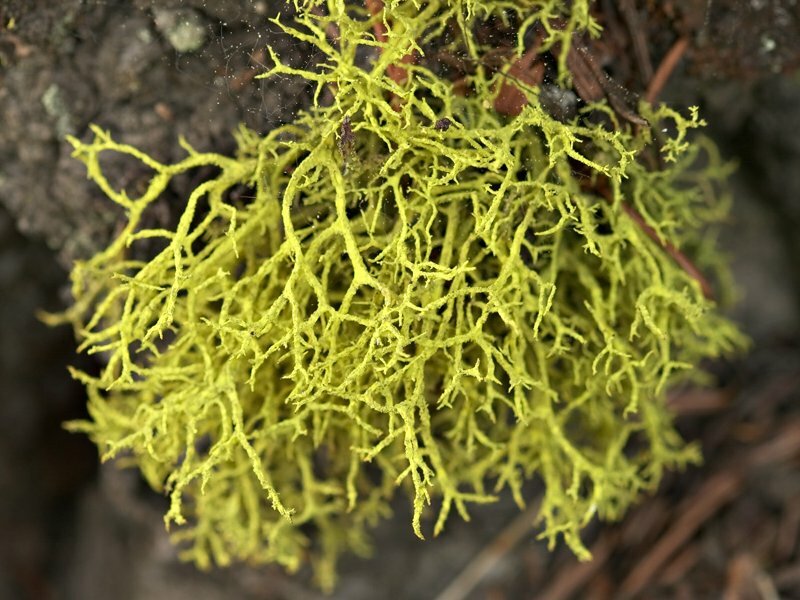 This particular lichen was found growing at the trunk base of a Pinus ponderosa near Merritt, British Columbia. 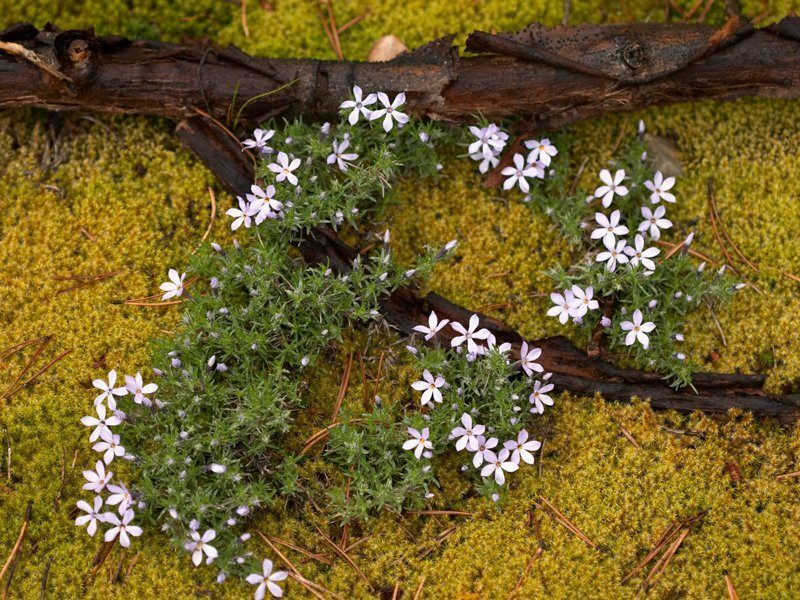 Spreading phlox forms mats of flowers at mid- to high elevations. This photograph, taken at roughly 1500m (@ 4900 feet) above sea level, was the lowest I observed the plant, while driving up the switchbacks on the side of the mountain capped by Blackwell Peak in E.C. Manning Provincial Park. 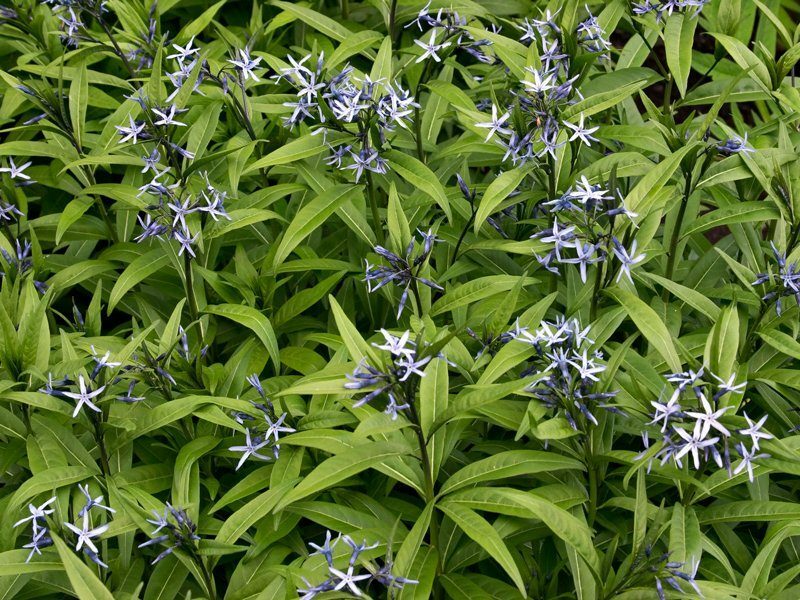 Like many Chinese genera of plants, Amsonia also occurs in eastern North America. Atypically, however, the centre for diversity for Amsonia is in eastern North America rather than Asia (compare with Magnolia or Acer Section Macrantha (the snakebark maples)). The wheel tree is now in full flower, which will last several weeks. Last year, I had the luck of being able to attend the awarding of an honourary degree from UBC to Bishop Desmond Tutu, and I keenly remember him asserting, “I am, because you are.” (which is deceptively simple). To me, the people who live this philosophy are the real heroes–the individuals whose sense for the “other” is so keenly developed that they cannot help but act or speak out; they are the embodiment of the human potential for good. I’m generous with who I accord as personal heroes–it includes broad swaths of people, from palliative caregivers to artists who provoke me to think differently to scientists who (after looking at all of the facts) cannot help but advocate for the Earth and its organisms. I had the privilege yesterday of meeting one of those scientists: Dr. Daniel Pauly (a profile of Dr. Pauly from the New York Times). I noticed Dr. Pauly at the entrance to the garden, so (boldly for me) walked up and introduced myself. Needless to say, I was delighted when Dr. Pauly, his wife and guests from Germany accepted my offer of a personal tour. Now, I’m certainly not the best person at the garden to give a tour–I can think of at least a half dozen other staff members who’d be better, along with the Friends of the Garden who are typically responsible for tours. Still, the plants in the garden make it easy, and the Asian Garden is in fine shape: the 30m high Clematis montana scrambling up the native cedars is a cascade of blooms, the Meconopsis betonicifolia (Himalayan blue poppy) punctuates the green foliage here and there, and this Delavay mock orange stands out with its combination of colours. 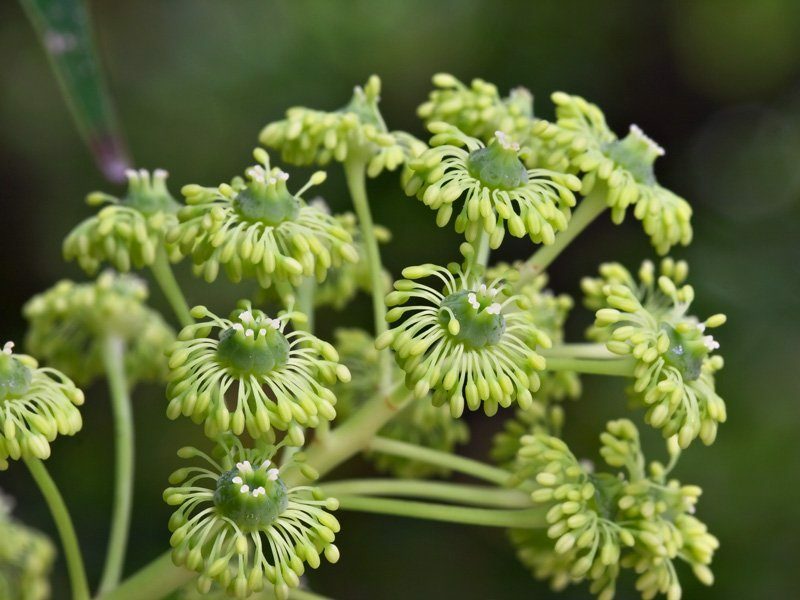 As that linked page suggests, the contrast of the calyx and petals is best seen before the flowers are fully open, which is why I’m pleased with this photograph; it has the flower buds at a number of stages. Speaking of scientists I regard as heroes, it’s an ideal time to explain the rest of the tagline for the Photo of the Day, which I alluded to in the entry on Salvia discolor. As I interpret her comments, Sandy is okay with being imitated, so I’ve readded the word “Daily” to the tagline (I’m not creative enough to think of anything more suitable), but what is the inspiration for “In science, beauty. In beauty, science.”? 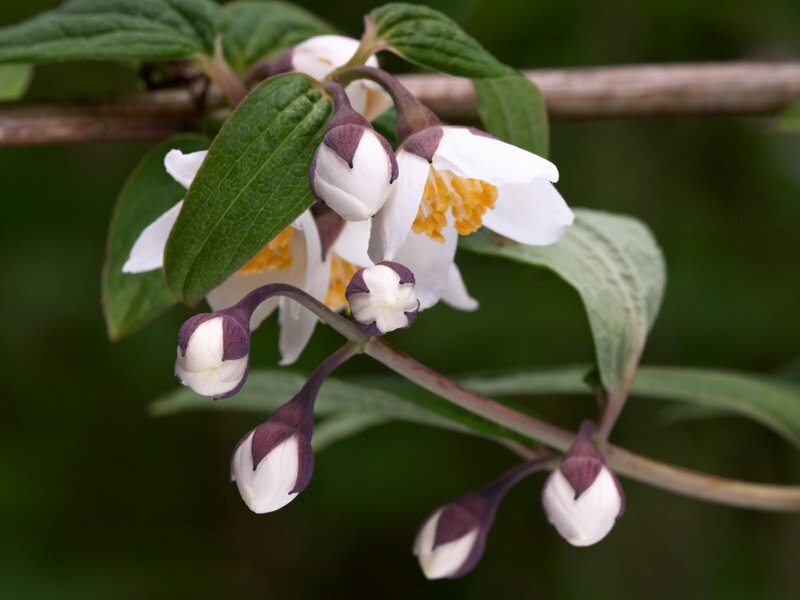 The thread of that idea can be traced back to a talk given at a 1982 meeting of the Canadian Botanical Association by the late Dr. J. Stan Rowe entitled “Beauty and the Botanist”. I wasn’t at that meeting, but fortunately, it was later made into an essay and is available online (and hosted on my uncle’s site). A quote: “The perception of beauty in the world is the proof of our belonging, the bridge to a wider sympathy extended beyond our own kind.” I am because you are.